Well hello there dear friends. It’s another week where I’ve risen to the challenge set out by The Reverie Journal. Every Monday they provide a new poetry prompt, so if you fancy writing some poetry and are looking for a theme to inspire you, why not head over there and go crazy! This week’s challenge was to use a series of 14 words. Usually it is quite a feat to incorporate all words in these exercises but I have decided to give you more bang for your buck because I am such a nice and generous chap. For your personal viewing pleasure, I have poured blood, sweat and tears (not literally, that would be gross) into knocking up a left and right handed acrostic poem. The only liberty I have taken is with the words themselves, where I have been forced to pluralise in places but I’m sure you will forgive me for this when you get a chance to read it – hope you like it! 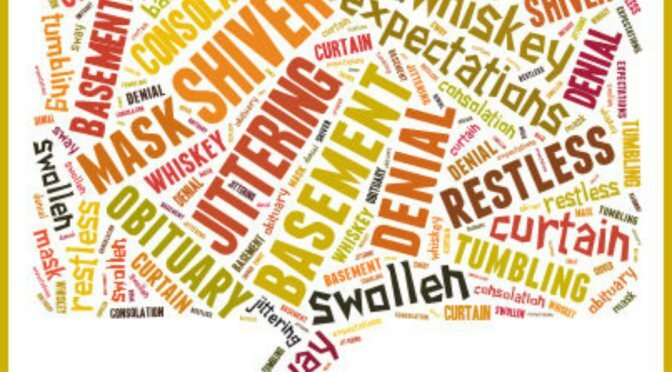 (Incidentally for posterity and macho posturing purposes, the words that were tasked to be used in this piece were basement, consolation, curtain, denial, expectations, jittering, mask, obituary, restless, shiver, sway, swollen, tumbling and whiskey). So without further ado – let’s unleash this beast! 1. The Wandering Poet – A dream..
5. Thoughts of a crooked mind. – The Abduction. 13. Jojo Joy’s corner – I got me a new fresh Rythm for my Soul! 16. Designer Sophisticate – Wanna read a crappy limerick? 18. Blogging Mysteriously – Meetings, cab, accident. 21. My Moleskine Margin Notes – It’s that morning, that one. 22. My Simple Life – What am I, invisible? 30. What The Frax – The Days Were Dark Ever Since. 32. Random Brain Musings – I Think That Was A Cat!!! 33. They, You and Me – Heaven. 59. All Things Cute and Beautiful – Being Unsuspecting! 67. Me – Who am I? – Borrowed or Stolen? 87. Julie Powell – Graphic Artist – Bad Day! 89. PURSUIT OF HAPPINESS – Tragedy?! 101. Gadarene Dream – Best. Luck. Ever. 102. Growing Happiness A Paradigm Shift – To Do Lists need to be Done. 103. RoJo1990 – Our last dawn together. 116. The Wandering Poet – Where..
117. From One Crazy Life To Another – Thank you, Facebook. Sarcasm is amazing! 120. Passion through Poetry – Thursday Dark Night! 122. Thoughts of a crooked mind. – In the middle of the night. 123. The Wandering Poet – Words one may some day speak..
143. PURSUIT OF HAPPINESS – Listen to your body! 144. LiveOutLoudAndProud – Flipping OBSESSION! 154. Carter Vail – What!?! No cake!?! 156. She’s Rambling – Where are you? 165. Not a Punk Rocker – What is “Normal”? 176. To Wear A Rainbow – What a night! 195. wtf Am I On About Now? – Lisa again? 215. Zezee with Books – Is There Someone in My House? 225. Jojo Joy’s corner – Devilish or Angelic are we truly closer to be ? 230. Beauty is found everywhere. I am working on. The ipad again… The computer will jot connect with the internet. I will try. You sound like. William. Shatner. Good luck, it is only there until midnight EST then voting closes. Front page, if you scroll down you will see a list of entries including mine. Thsnks buddy, appreciate it. Well done sir. The shifts and all. Also isn’t acrostic supposed to stand for some thing? P.S Check out the poem that I made I turned 20 on Wednesday so I wrote a piece on my birthday cake. So check it out and tell me what you think. My acrostic stands for taking two distinct opinions based on which side you are looking at, so whilst the left hand side is how we react logically, the right hand side is looking at things more creatively, along with being more flexible and going along with the flow. I understand that the left brain/right brain theory has been debunked but I still like the nature of the concept of looking at things through the lenses of logic or creativity. You are right in that typical acrostics have words/meanings that read down but I like to break the rules and build monster ones that follow patterns or other avenues to keep things interesting and fresh. Happy Birthday for Wednesday! I will head over and take a gander at your poem soon. Awesome well keep doing what your doing man. XD . And stay tuned and happy thanksgiving! I love your take on the acrostic and combining it with the prompt worked wonderfully for you. You’ve created something amazing. Thank you Laura – these are so much fun to build, particularly when they are complicated – the restrictions on the structure can enhance your own creativity when building it! I find myself wanting to retreat to the basement figuratively if not literally much of the time. ‘Tis a very mean world we live in. Thank you so much for your visit to poetryofthenetherworld.blogspot.com and for your kind comment on Mo and Cie’s poem. It means more than you know! Like the Acrostic idea: will try this (if I remember) next! !